Piece of cake. All in a day of the life. Cars gonna feel great. Nice work. It started raining so not much was done today. 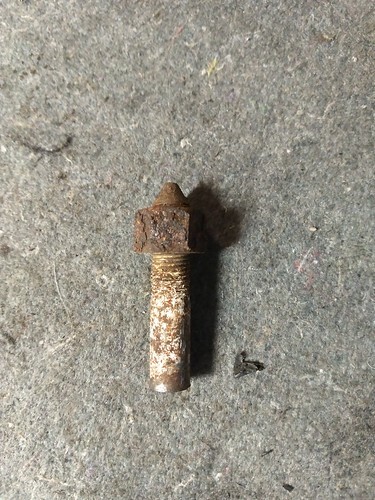 On the upside, the rusted nut/bolt from the subframe is out. wow just went through the whole thread. so much patience you have! No pictures yet because the car hasn't been cleaned since I finished, but it has been done for a while now. What an absolute nightmare this project was. It all pretty much went downhill after my last post, hopefully, I remember everything. Once we dropped everything out of the car, things were looking like they were going to go pretty smoothly. I got the new subframe in the next day and started respraying the trailing arms and lat links in fresh cherry blossom. Then it came time to swap diffs. Five of the bolts holding on the rear and side covers broke off inside the diff case, and the rear cover and one of the side retainers had corroded so badly that the outside part of the bolt holes cracked right off. Swapping the diffs went fine, but the case had to be ground down a bit to get it in correctly. I grabbed some new hardware and blasted the case with MAP gas to get the broken bolts out. COuldn't find any used retainers or cover near me, so I reused the old stuff. No leaks so far. At this point, I had started putting the lateral arms in the car, and my dad moved onto the long link bolts. It took him a collective 8 or so hours to get the first bolt out of the hub; lots of MAP gas, rost off and drilling. It gave him a game plan though, as he had the next side out within an hour. 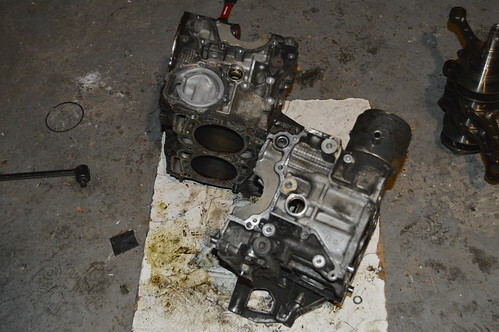 Once those were out, it all went back together fairly quickly with liberal use of Permatex anti-seize. Still not done! With everything under the car bolted up, it was time to replace the rear struts. They came out easy peasy, but the Ground Control spring collars were another story. I rented a puller to get them off, and it worked on the first one, but the second collar was WELDED to that strut. Ordered two new ones through GC, and two days later I had them, but they sent me the wrong ones. Three days after that, I finally had the right ones and put everything back in the car. If only the story ended here. While we were waiting on the GC stuff, we started wiring up my MapDCCD. That install went pretty smoothly, and through some troubleshooting with wiring diagrams, got everything figured out in a few hours. After everything was bolted up, I drove the car around the court I live in to let the suspension settle and shut the car off in front of my house to lower the back of the RS. We dropped it and then she wouldn't start. Power to the cluster but no relay click no ignition power, nothing. After digging around diagrams and under the car, my dad noticed the ignition switch plug looked loose. It fell apart in his hand causing us to spend another 15 minutes trying to figure out what wires went where in the connector. Finally, it was good to go! I got my alignment a few days later and left for college the day after that. Two weeks after I got to Albany, I noticed my temp gauge rising on the way to class. I kept it as cool as I could and found a ripped top rad hose spraying coolant all over my engine bay. That put the car out for another few days until I bought a new hose and refilled the coolant system. That was last week, and this journal is now up to date. I'm just trying to keep it alive. Pics soonish probably. Thank you! It's my only car, and I'm trying to make it the best it can be as a daily. Its given me lots of stress but I have a lot of love for it. Thank You! It had been 130K since its last refresh, and it was running well, but the HP bug bit my dad, so it came apart. 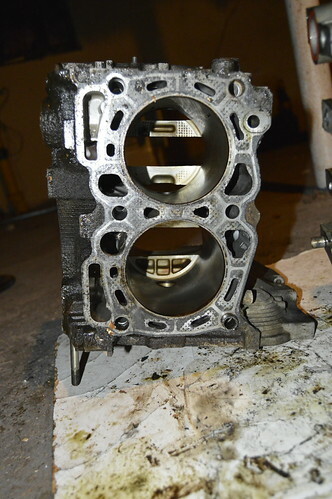 10:1 compression, ported heads, bigger cams and PMO 40mm Carbs to replace the CIS injection. 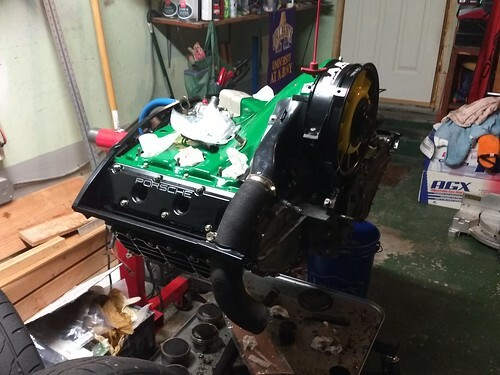 It was only taken apart so that he could put in a GT3 oil pump and it snowballed from there. He's shooting for 240-260 ish hp. It weighs under 2400lbs too, should be a riot! He plans on taking it to the track with me next summer, can't wait for that. Last edited by Flat6ForLife; 09-12-2018 at 09:26 AM..
Just split my first EJ, and a special one at that. I'd love to keep it but rod knock has started to set in on my 25d so I'll need the money. Its been a few months since I posted here. The car is Ok but needs a new set of suspension as the AGX are blown in the front, the 25d is starting to knock regularly and not just when warm. The clutch fork broke at the beginning of December and I couldn't fix it in the street at school so I had to pay for it. I had them replace the clutch while they were in there as well as the rear main seal and oil plate. A large tree branch fell on the hood and put a couple dents in it as well. She is still daily driven however and is an absolute monster in the snow with the dccd and suretrac in the back. Most importantly, she still puts a big dumb grin on my face. Have to get it ready for track day season too as my dad's 911 is just about ready. I graduate college in the spring too. Lot's to do. No crazy updates, ownership has been pretty uneventful for the most part. I had a van double park in front of me on the street and open its rear door into my passenger quarter, so I'm dealing with the insurance now to cover it. The van owner has been cooperative through the whole thing thankfully. Also had someone back into me and bend the front edge of the hood down; cracked the paint on it too. No idea who did that, so covering that'll be on me. The roads in Albany are horrific and riding the bump stops in the front makes me feel guilty every time I drive it. I have an EJ255 I'm trying to sell and the money from that will go to the new suspension. I like the idea of coilovers for the track, but its a daily and I haven't experienced any of them first hand. The roads around me are pretty crap, but being home, I would be able to autocross the car as well. There is a set of 5x100 Ohlins FPS on Nasioc that I've been looking at instead, but I'm not sure what set of springs I would pair with it. Anyone have any ideas? I know the FPS are loved but haven't seen any definite choices for springs. Also looking for insight into quality coilovers for daily use (Bilstein, Ohlins, etc...). Just not sure which direction to take.